Bob Hendrix Stadium | Cherokee Co N.C.
As the clouds made their way towards the stadium, so did the die hard Murphy Bulldog family. An hour before the game the seats started to fill, the atmosphere started to gain more, and more power. 20 minutes before kick-off, the “Youth Dogs”, the younger Bulldogs, were on the field awaiting their champions, the clouds began to scatter, yet the Thunder remained, the thunderous 12th man were ready for a battle against the Bobcats of Gilmer. The starters were announced, and the lightning was unleashed. The Gilmer Bobcats won the coin toss and that was all they were going to win on this glorious evening under the bright Friday Night Lights on David Gentry field. Bobcats defer, game on. The stage has been set, Gilmer kicks the ball to Murphy, and so it has begun. “Captain” Curry, play-action fake, looks right, looks left, the electricity in his arm gathers strength, he reaches back, and fires a lighting bolt pass 30-yards down the field to his wide-receiver Travis “The Atlantic Lighting” Seabolt racing down the sideline, he catches the pass with both hands, taking it in for a 58-yard touchdown reception! “Miss Automatic” Katelyn Jones misses the extra point, shrugs it off, Dogs up 6-zip two plays in to the game. They say lighting doesn’t strike the same spot twice, they were wrong! The thunderous 12th man exploded as “Captain” Curry found “The Atlantic Lighting” Seabolt for their second connection of the game. The atmosphere is electric, the Bulldogs are running on a fully charged mega-battery not of this world. Jones forces the pig skin through the uprights, bringing us to a 13-0 Bulldogs early 1st quarter lead. The Murphy Bulldogs defense was in complete control of the Gilmer offense. After forcing the Bobcats to punt the football, Murphy marches down the field into the Bobcats redzone. “It’s not marble, it’s Slade” McTaggart gets the ball, hits the hole, breaks it outside, and bolts into the endzone from 16-yards out leaving the Bobcats in a cloud of static electricity and disbelief. Bulldogs go up by 20 still in the 1st quarter of play. The combination of a lightning fast football team, and a thunderous 12th man leads to mistakes, Gilmer fumbles, and Bulldog Cory “Mad Cow” Farmer recovers the ball for a Bulldogs, first down! Threatening from just inside the redzone, Kadrian McRae electromagnetically teleports himself into the endzone, if you blinked, you missed him. 20-yard rushing touchdown for McRae, get that man a sandwich! They were giving out lighting bolts for lunch at Murphy High School on Friday, clearly McRae had seconds, McRae strikes again, cuts right, turns up field, holds down the turbo boost button, and he was gone. 23-yards and 1.5 seconds later he was in for 6. “Miss Automatic” Jones hits the extra point, it’s 34-0 Bulldogs and it’s not even halftime yet. Get Gilmer some electrical tape for their gloves, Bulldogs are shocking. The offensive line was a hurricane force thunderstorm Friday night, and the Bobcats had no choice but to seek shelter. Devonte “Show me the Murray” Murray, behind #HurricaneOffensiveLine, tidal waves it in from 23-yards out with ease to put the dogs up 41-0 after the successful extra point try by Jones. More Bulldogs defense causing all kinds of problems for the Bobcats, Bulldogs get the ball back, and “it’s not marble, it’s Slade” McTaggart rumbles his way in from 15 yards out, boarding up the last of Gilmer’s windows. We hope the Bobcats have plenty of water and canned goods for the ride home, this Bulldogs Thunderstorm was too much for the Bobcats. The Bulldogs send in the pups to wrap up the second half, and that would be the final score of the game. Smokey Mountain Conference play starts next week with Robbinsville coming to town this Friday. Expect more of the same intensity, if not more, out of the Bulldogs this Friday. They have been a team possessed since their heartbreaking loss in Franklin a few weeks ago. Curry is ready to throw the football through a mountain, and McTaggart would tackle a tornado if he had to. Check the voltage meter on the field the last two games played by the Murphy Bulldogs, the reading is off the charts! MURPHY, N.C.- In tonight’s game , the Murphy Bulldogs are at home against the Gilmer Bobcats. Coin toss is at 7:30 p.m. The first 2 quarters of the game will start under partly cloudy skies, a cool 75 degrees with 73% humidity, and a 0% chance of rain. Look for the temperature to drop down around the half-time mark, with the temperature decreasing down to 69 degrees, and eventually ending up at around 62 degrees for your safe ride home. 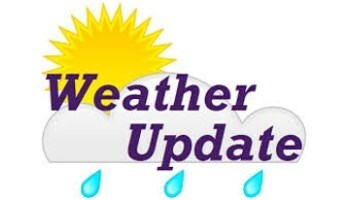 Don’t expect any rain, as there is only a 5% chance of precipitation starting near 8 p.m, and it will be an exceptionally humid evening with low temperatures. 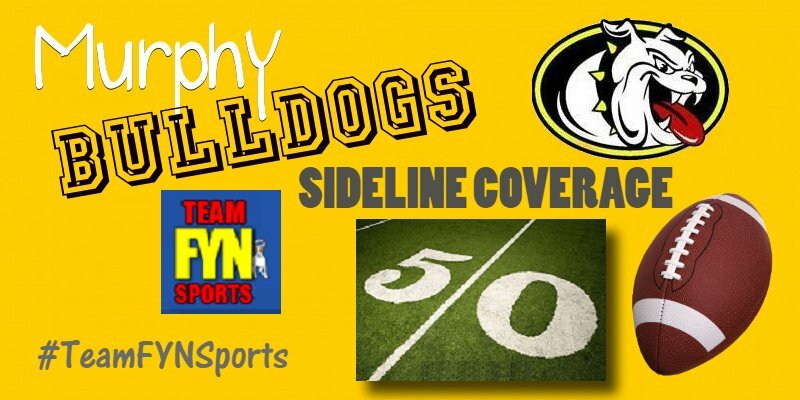 You might want to bring your favorite Murphy Bulldog’s jacket or sweater with you to the game.